Razor bumps -- also called pseudofolliculitis barbae -- are little bumps that develop after shaving. The cut hair ends up curling back into the skin and creating small, round bumps in a concentrated area. 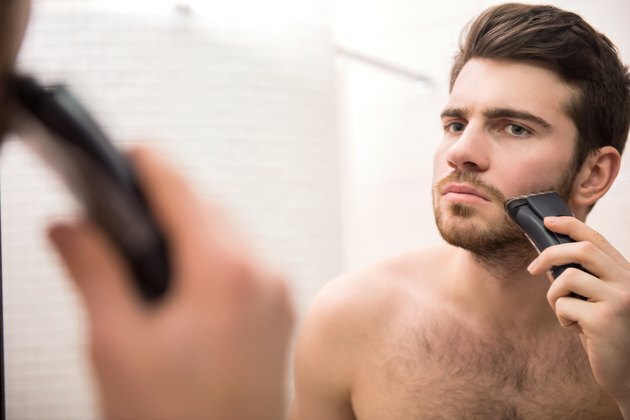 The best defense against these unsightly bumps is to shave in the direction of your beard if you use a disposable razor -- or switch to an electric shaver altogether. A hot shower also helps to soften the hair and open the pores before shaving. Despite your best efforts, razor bumps might still appear. You can easily save face by using rubbing alcohol and a pair of tweezers to lessen their severity. Place a dime-sized amount of cleanser onto your fingertips. Gently massage the cleanser in circles around your entire face. Allow the cleanser to penetrate the skin for one minute. Rinse with warm water and pat dry with a clean towel. Hold the tweezers over the sink and pour a tiny amount of rubbing alcohol on the tip to disinfect the tool before it touches your face. Slip the tweezers tip under the hair loop where the hair is ingrown. This may also release some fluid. Gently and carefully lift the embedded hair out with your tweezers. Continue on the other bumps. Saturate a cotton pad with rubbing alcohol, and swipe the pad over the newly opened razor bumps. The alcohol acts as a disinfectant and helps keep bacteria and oil out of the opening. Apply a pea-sized amount of over-the-counter hydrocortisone cream to your fingertip. Smooth the ointment over the bumps. This helps to calm inflammation and irritation caused by the trapped hair. Visit a board-certified dermatologist if razor bumps become a chronic condition. You may need an antibiotic. Always pat -- never rub -- your skin with a towel. Rubbing can scratch the skin and lead to further irritation. Refrain from squeezing your razor bumps. The result can be further irritation, a more impacted hair or an infection. Try not to scratch razor bumps because you'll be at risk for a bacterial infection if the skin breaks open.